phone, you should be entering the system code. 0 to 9 allow you to enter number. Reset : To reset station function. Clear : Clear you enter number. Select : Select one of stations. Play : Play ringtones with IrDA Master. "Music station" or "Figure station"
Music station has 200 musics in each pices. Music station and Figure station. IrDA Master is a tool for cellular phone that can easy change Nokia cellular phone ringtones or graphics. 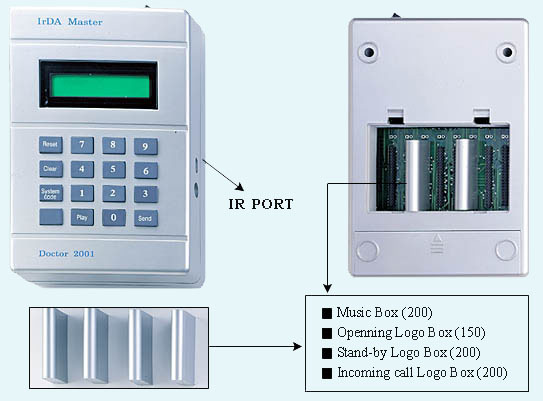 IrDA Master is designed to work with a wide range of phones in the Nokia GSM range. Note 1: IrDA master can only be used in conjunction with 2 player snake mode on handsets. Note 2: Some operators override the startup logo feature on this phone. Note 4: All support function will be extending by music station or figure station. Note 5: he IrDA master is a Class 1 Laser Product. Note 6: The preferable distance between two devices in infrared connection is up to 45 cm. Note 7: The IR ports of the two devices must point at echo the other. Stand-by logos are displayed when you are logged onto the network (most of the time). selected correctly in the send dialog. position to enter it into - this should usually be set to 1. The startup graphic is the image that is displayed when you first start up your phone.